A Simple Collective is pleased to present Issued ID, a three-person exhibition of video works by Elizabeth Axtman, Tim Roseborough, and Chris Vargas. The exhibition opens Thursday, July 18 and continues through Saturday, August 31. For Issued ID, three artists confront the complexities of identity through videos in which the artists each inhabit a protagonist’s role. Direct and unapologetic, the works grapple with a tenuous sense of self that ambiguous or hybrid identities can create, both from within and from the outside. The exhibition title references the government-issued identification cards that define an individual by seemingly simple surface traits—age, race, gender, height—but is also a play on words, reflecting the many “issues” brought up by being forced to define a person in glib terms and the complexities of an identity that does not fall into a single check-box. 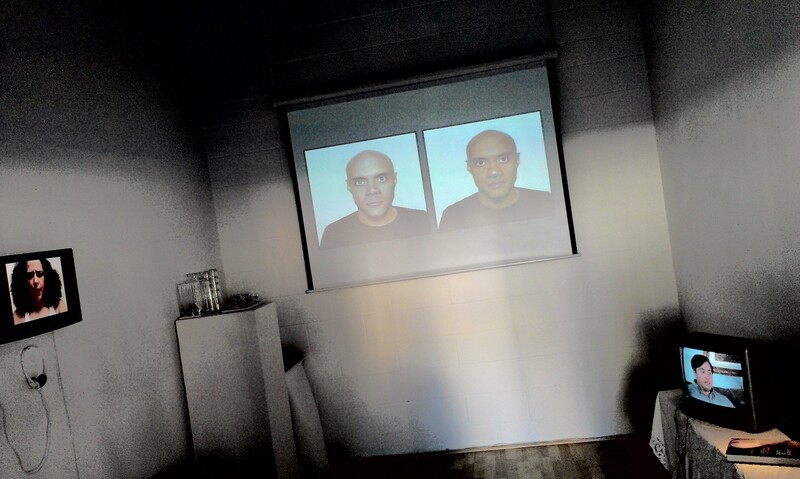 Through two adjacent loops, Tim Roseborough’s Facial Deconstruction (after Michael Jackson) (2008) presents the artist’s process as he digitally manipulates his own face to copy the facial changes of the superstar over time. Renditions of Jackson’s vocal acrobatics narrate the the images as they run continually in both directions. Chris Vargas’s video Extraordinary Pregnancies (2010) revisits the “First” Pregnant Man, Thomas Beatie and his wife Nancy, re-scripting their vulnerable, yet guarded interviews with the big shots of tabloid media. Using original footage from interviews with Barbara Walters and others, Vargas proposes his own alternative answers to the proposed questions of gender and propriety. In Elizabeth Axtman’s American Classics (2005), the artists inhabits characters discussing race and blackness and takes the conversation to the audience by facing us close up and mouthing lines from vintage film clips. The effect is one of direct dialogue with the viewer, making the conversation a personal one, while reflecting on the history presented in these films. Shown together, the works offer a common thread of dialogue about the struggle for definition when you’re not easily defined.